Lock in a great price for BH Mallorca- Adults Only - rated 8 by recent guests. All the negative feedback is really surprising, our stay was perfect. The food was amazing and all facilities well maintained. 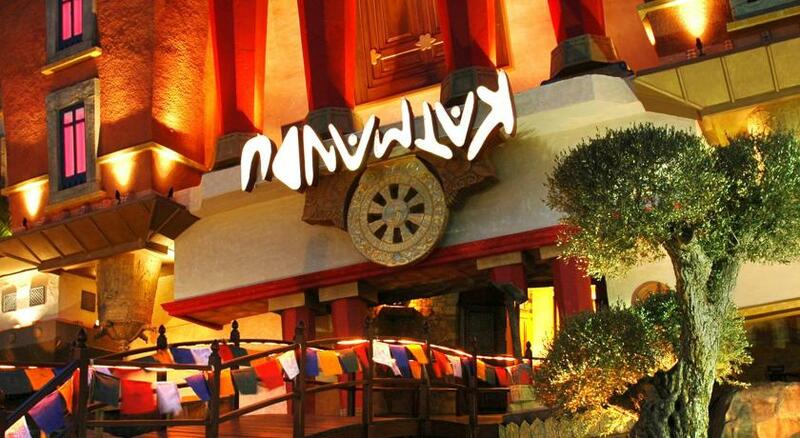 Rooms are spacious and decorated in modern taste - they represent party spirit of this place. We came here after high season so we couldn’t really complain about the hotel being overcrowded. Still, the staff was keeping everything in order and making sure our vacation was great. Hotel is located very close to the beautiful Magaluf beach. Also, there are many shops/ bars just few steps away. It's an adults only hotel, so you won't find any children around. The pools are great, the water park is awesome. I went in october, I think the hotel closes by the end of the month, so it wasn't very crowded, which is good. Great location, 5 minute walk from the beach, it has a bus stop to/from the airport very close. Lots of restaurants, supermarkets, pubs and stores around. There is a parking right in front of the hotel. Wifi is good and the staff is nice. The rooms were beautiful. The design, structure , friendliness, cleaness and location were all perfect. 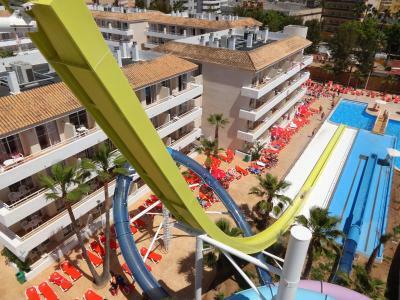 It is an amazing hotel located in a perfect location in magaluf, There are 3 big swimming pools and if you did not have enough of that, there is a waterpark with different slides where you can enjoy yourself during the day. Liked the outdoor water activities. Liked the location, and especially each person receiving their own wristband for access to rooms! 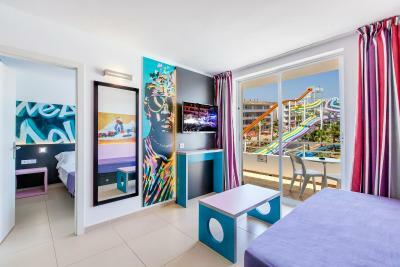 One of our top picks in Magaluf.BH Mallorca- Adults Only is located in Magaluf. 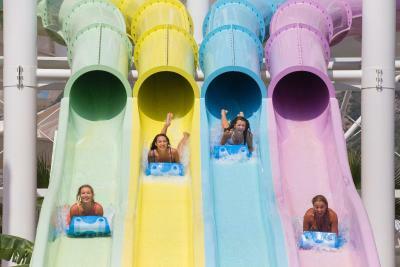 Guests have access to Island Beach Club, that holds 2 pool parties every week in summer and includes Bali beds and chill out areas, Twisted Waterpark, the world's first 18+ water park that includes 9 slides as well as a wave pool and 3 giant hot tubs. Free WiFi is available throughout the hotel. Each air-conditioned room comes with a TV, 2 full-length mirrors, a fridge and balcony. Private bathrooms come with a hairdryer, a walk-in shower and free toiletries. 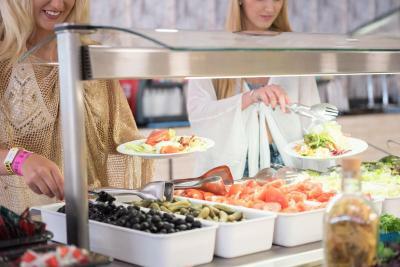 The property also has a buffet restaurant and an all-inclusive meal plan including national alcoholic drinks from 9:00 to 21:00 every day. 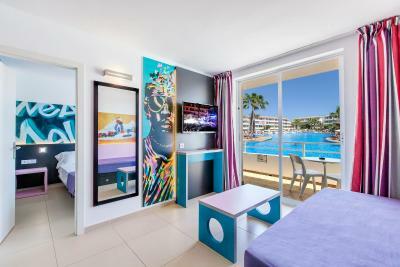 This is our guests' favourite part of Magaluf, according to independent reviews. This property is also rated for the best value in Magaluf! Guests are getting more for their money when compared to other properties in this city. BH Mallorca- Adults Only has been welcoming Booking.com guests since 6 Apr 2010. When would you like to stay at BH Mallorca- Adults Only? This air-conditioned room is suited for up to 5 adults and features a bathroom with a spacious walk-in shower, shampoo, gel dispensers and a hairdryer. There is a twin bedroom and a living room. The room comes with high speed WiFi, a large flat-screen TV with international TV channels, a fridge and a safe. Rooms are cleaned daily and fresh towels and bed sheets are provided 3 times a week. This room offers views of the street and the surrounding area. 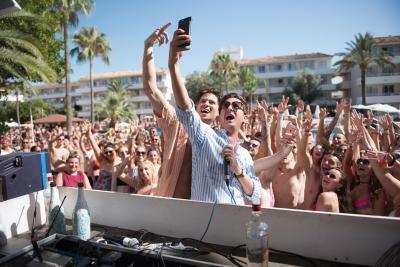 BH Mallorca offers a unique party and fun concept during your holidays. With 656 rooms with WiFi and air-conditioning. 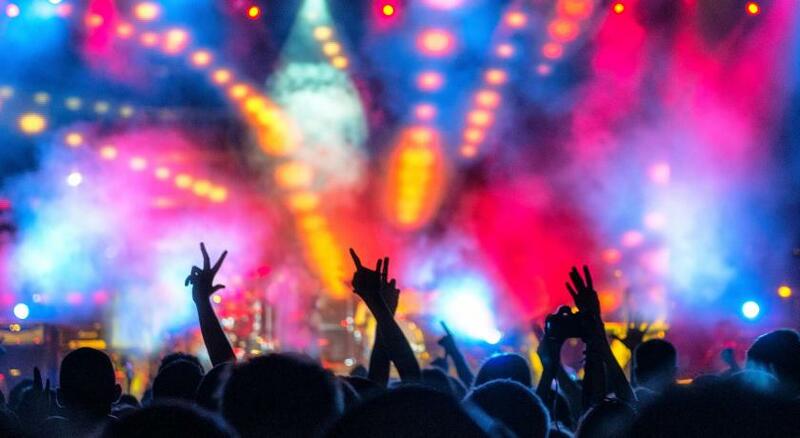 The ideal location for a fun experience, try Twisted Water Park, Island Beach Club and Stage. House rules BH Mallorca- Adults Only takes special requests - add in the next step! BH Mallorca- Adults Only accepts these cards and reserves the right to temporarily hold an amount prior to arrival. One small thing - the beds - it was slightly uncomfortable because they were moving apart (they were joined into one big bed but had wheels and could not keep together). But it is clearly stated in the offer so nothing to be surprised with :) Apart from that - no more complaints! Since it's an adults only hotel most of the guests are young people who go there to party, so it's usual to see drunk people, also some people partying and making lots of noise in the rooms at night. I wouldn't go there in the summer if I wasn't in that mood. The buffet restaurant schedule isn't very good in my opinion, breakfast only opens at 9am and dinner closes immediately at 9pm. Mainly the food. I'm sorry but I have been to many all-inclusive hotels(3-star and 4-star) and this by far was the worst food I have ever encountered. For a 4star hotel the food is terrible. Rubbish inly one drink policy as this meant myself and my partner couldn’t go get a drink for us both and had to go individually, bar staff were rude and food was disgusting, we ended to eating out. Lack of pool parties because it's out of season. Now you can only get one drink per person last year it was 2 per person. Pool opening times Food and beverage closing times.